Green China - 252 items found. By Samuel Alcock & Co active 1826 to 1853. Small jug printed in green. Backstamp: Forest Florentine China This has some brown mottling and a little wear to the handle otherwise excellent condition. By J & MP Bell of the Glasgow Pottery, Dobbies Loan, Glagow, active 1842 to 1928. A stunning dish printed in green in this fabulous floral pattern and here with tree and well feature. Backstamp: Royal Conservatory J & MP B & Co and impressed J & MP B & Co Royal and printed registration mark for 1856. A little minor surface scratching and wear to the outer rim otherwise excellent condition. A fine example of this wonderful pattern. Green and white with gilt. Green and white with wavy rim. Some wear to gilt. Good condition. Green and white. Large wavy rim bowl with moulded body. Border decoration to the rim inside the bowl. Green and white with gilt rim. Some wear to gilt but overall good condition. Green and white with gilt. Gilt is more worn than it appears in the photograph. Green and white with wavy rim. 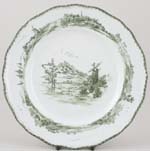 Green and white with gilt rim. Some wear to gilt and utensil marks, but good condition overall. Green and white with gilt rim. Some wear to gilt and utensil marks, but overall good condition. Green and white with gilt rim. Gilt rim a little worn. Excellent Condition. 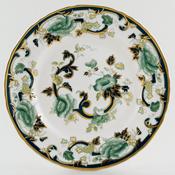 Green and white with gilt rim. 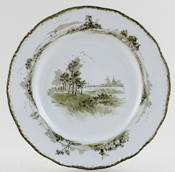 Green and white with gilt rim. Cup only. Some wear to gilt, but overall good condition. Made in England. Brand new and first quality, dishwasher and microwave safe. Olive Heritage. With Calico border decoration. This item has been discontinued by Burleigh, but limited stocks remain available. Bone China. Backstamp: Crown Staffordshire England and in script 5864. Light crazing, a little surface scratching and touch of wear on the back otherwise excellent condition. Made by Thomas Dimmock of Hanley, active 1828 to 1859. 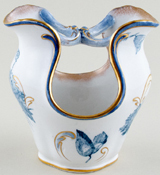 The pattern Geneva is a series of Swiss romantic scenes, later produced by Doulton. Here printed in green on a large Stilton cheese stand. Fine crazing to the glaze, with just a few areas of light staining, but overall in excellent condition. A fine example of both piece and pattern. Green printed backstamp Geneva within cartouche, with D beneath. Impressed Dimmock monogram. The green glazed wares of the Don Pottery are well known and found almost exclusively on dessert wares. The design consists of the national emblems of the rose, thistle and shamrock, so we have given it the name Union, as one assumes it was inspired by the Acts of Union 1801. No maker's backstamp, but impressed worker's star mark, which is recorded as being used by Don Pottery. The glaze is crazed and on the back is an area of glaze, where this plate has touched another in the kiln and disfigured the glaze. The face is OK apart from a couple nicks or nibbles on the rim, which look as if they may have started as glaze faults. Early Norfolk printed in a pretty shade of green. 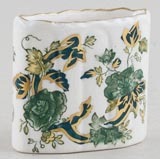 This comport is quite unusual in that it has pattern printed underneath also. Backstamp: Doulton Burslem England Norfolk Rd No 241612. Light all over crazing with a little wear to the rim otherwise excellent condition. Early Norfolk printed in a pretty shade of green. Backstamp: Doulton Burslem England Norfolk Rd No 241612 and impressed date for 1902. Surface scratching otherwise absolutely fine. Early Norfolk printed in a pretty shade of green. Backstamp: Doulton Burslem England Norfolk Rd No 241612 and most impressed with date for 1902. Some surface scratching otherwise excellent condition. Early Norfolk printed in a pretty shade of green. Backstamp: Doulton Burslem England Norfolk Rd No 241612 and impressed date for 1902. A little surface scratching otherwise excellent condition. With gilt. A most unusual vase with cross banded detail across the top and deep cut outs to the either side and decorated with fabulous poppies. Backstamp: Doulton Burlsem England Shirley Poppies Rd No 258549. Inside to the base there is some loss of glaze to the stilt marks otherwise excellent condition. With gilt. An ornate two piece sponge dish, base and pierced strainer, decorated with fabulous poppies. Backstamp: Doulton Burlsem England Shirley Poppies Rd No 258549. The occasional very minor blemish to the strainer otherwise excellent condition. With gilt. Lovely box printed in a subtle green/grey tone. Backstamp: Worcester DB & Co. Light all over crazing and the gilt is very worn. There are a couple of tiny stains inside the base and to the handle on the cover. Underneath the cover there is a tiny chip and tiny hairline to the inner rim. Sounds much worse than it looks! By Elkin Knight & Bridgwood or more likely by one of the other later Elkin, Knight partnerships of The Foley Potteries, Fenton. Printed in green with two scenes of Hannibal's historic crossing of the Alps, complete with the famous elephants, all set within trellis and floral borders, which here is than usual, perhaps to fit the smaller piece. No maker's backstamp. Possible partial hairline or stress crack at base of handle, where it joins the body. Some scuffing and a small old chip under the foot rim, but all minor. Overall excellent condition. Ford & Sons. A lovely dish printed in green. There is a little discolouration to the side handles and around the rim otherwise excellent condition. With gilt. 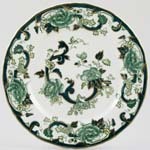 An extremely pretty dish with ornate handle and printed in a subtle shade of green. Backstamp: F & S B England ?nton Ware. There is a little wear to the gilt. The base has light crazing and one or two blemishes, overall excellent condition. With gilt. 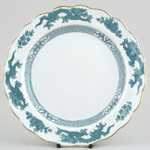 A most ornate dish with fabulous side handles and ornate finial to the cover. Backstamp: F & Sons Ltd Weir Burslem England. A little wear to the gilt and inside the base a little loss of glaze and discolouration to the stilt marks. Overall excellent condition. An absolutely gorgeous double spouted boat with embossed detail around the body. Backstamp: Furnivals Limited Trade Mark England Fabric Rd No 289038. Very pretty plate from this Swedish maker. Backstamp: Impressed Gustafsberg with anchor. Minor glazing blemishes to the face and a touch of minor wear to the rim but overall excellent condition. A most ornate pot standing on four small feet. Features Bolsover Castle. Backstamp: Johnson Bros England Old Britain Castles. One or two minor green smudges here and ther, overall excellent condition. With gilt. Small butter pat or coaster. Backstamp: Masons's Patent Ironstone China Chartreuse England. Excellent condition. With gilt. Lovely set of salt, pepper and mustard pots. Backstamp: Masons Chartreuse Made in England also on Mustard Patent Ironstone. Excellent condition. With gilt. Small stand with ornate side handles, would make a fabulous open butter dish. Backstamp: Mason's Ironstone Made in England Chartreuse Printed and Hand Painted. Excellent condition. With gilt. Backstamp: Masons Patent Ironstone Chartreuse England (Made in England on saucer). A little wear to the foot of the cup, otherwise excellent condition. With gilt. Backstamp: Mason's Patent Ironstone China Chartreuse England. Excellent condition. With gilt. Backstamp: Mason's Ironstone Made in England Chartreuse Printed and Hand Painted. Excellent condition. With gilt. Two handled cup with saucer. Backstamp: Mason's Patent Ironstone China Chartreuse England on cup, Masons Patent Ironstone Chartreuse Made in England on saucer. Saucer has light crazing, cup in excellent condition. With gilt. Backstamp: Mason's Patent Ironstone China Chartreuse England and in script C4889 Light crazing to the cover otherwise excellent condition. With gilt. Delightful little piece with a multitude of uses. Backstamp: Mason's Patent Ironstone Chartreuse Made in England.